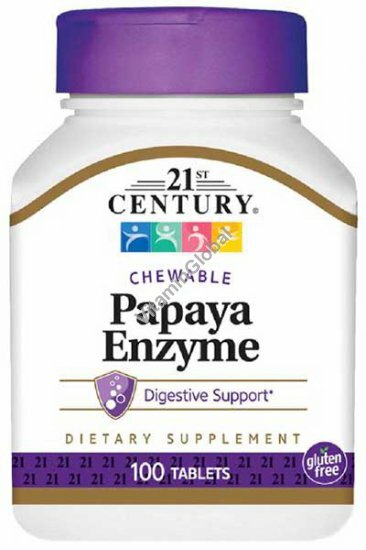 21st Century’s Papaya Enzyme is a maximum strength formula for healthy digestive function. Other Ingredients: Sucrose, Sorbitol, Natural Pineapple Flavor, Cellulose, Stearic Acid, Silicon Dioxide, Magnesium Stearate, artificial color FD&C yellow #6. Directions: As a dietary supplement, adults chew one (1) tablet, with any meal for maximum daily results, or as directed by your healthcare provider. Do not exceed recommended dosage. Available in packages of 100 Chewable Tablets.